The new ViseeO Tune2Air WMA3000A is the latest innovative plug-and-play product from ViseeO. 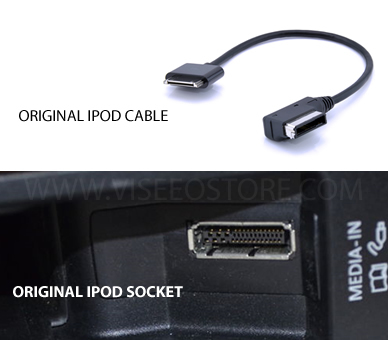 Instead of manually plugging the iPod into the cable connected to the media sockect every time you enter the car, you instead connect the Tune2Air WMA3000A with integrated cable to the original media socket which you would have normally connected your OEM iPod lead to. The Tune2Air is then left in the car permanently connected to the original iPod socket. Once the Tune2Air is connected to your car and paired with your iPhone/iPod, every time you re-enter the vehicle the Bluetooth connection will be established automatically, meaning that your full music library will be instantly accessible on your in-car iPod interface, without having to remove the phone from your bag/pocket and manually plugging into the cable. This allows for a much more enjoyable in-car music experience as you can simply get in and drive, without the risk of leaving the iPhone/iPod in the car after the journey. Wirelessly connect your iPhone/iPod/iPad with your cars existing iPod solution! The Tune2Air offers a complete level of integration designed to replicate the results of physically connecting your iPhone/iPod to the existing 30-Pin dock connector in the car. If your current iPod/iPhone setup shows track, album, playlist and album artwork info on the cars original screen then all this information can still be viewed on screen using the Tune2Air. The Tune2Air retains all of the cars original controls, so you can continue to use the dashboard and steering wheel controls present in your car to operate the iPhone/iPod in the same way as if it was physically connected. With the release of the iPhone 5/6 and the new Apple 'Lightning' connector, many thousands of car owners have found then cannot connect their new iPhone/iPod to their expensive factory-fitted iPod integration option. Many of the Lightning adapters available do not support audio and you find you are unable to use the iPod kit in your car. 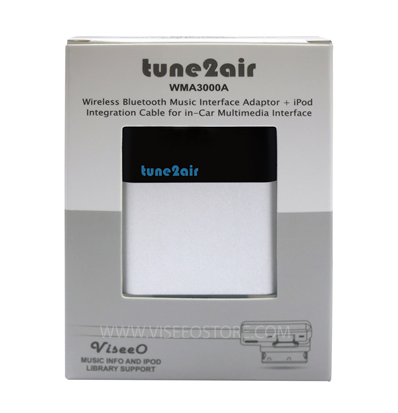 The inexpensive Tune2Air is the perfect solution to this; the connection between iPod/iPhone and the car is completely wireless utilising the latest Bluetooth technology, so it does not matter what type of connector your Bluetooth enabled iPhone/iPod has. The Bluetooth enabled Tune2Air is not only compatible with Apple devices, but also any brand of Android or Windows mobile phone. You will be able to stream music wirelessly to the iPod system in your car which was originally only designed for Apple products. Controls such as volume and skip track will also be retained on the original car buttons, so you can use the original head unit or steering wheel controls to skip tracks where compatible. As the Tune2Air is used with original in-car iPod kits, it is not possible to stream playlist or album art info from non-Apple phones, but you can still enjoy the same high quality audio from your Android/Windows phone through your original iPod system. Display full iPod music on the original car screen and control from the multi-function steering wheel using the ViseeO Tune2Air! IS THE VISEEO TUNE2AIR WMA3000A COMPATIBLE WITH MY AUDI/MERCEDES/VW VEHICLE? The Tune2Air is compatible with iPhone 4, iPhone 4S, iPhone 5, iPhone 6 and 6 Plus, iPad 1st Generation, iPad 2nd Generation, iPad 3rd Generation, iPod Touch 4th Generation and iPod Touch 5th Generation. It is also compatible with Windows/Android based Bluetooth enabled phones. Tune2Air is compatible with iPhone 4, iPhone 4S, iPhone 5, iPhone 6 and 6 Plus, iPad 1st Generation, iPad 2nd Generation, iPad 3rd Generation, iPod Touch 4th Generation and iPod Touch 5th Generation. It is also compatible with Windows/Android based Bluetooth enabled phones. Hi there, will this work with the iPhone 8+??? Will this work with iphone 7? Can you please let me know if this will work with my R8 Spyder 2012 and an iPhone 6? Hi yes if the Spyder has a older style iphone/ipod connector it will make it bluetooth and then it will work with your iPhone 6. Can you please let me know if I can play my iPhone 5s with my BMW F25 X3 xDrive M Sport and have all the track, artist, album details displayed? Hi yes it will work fine with the iPhone 5.